Check out the official trailer for the Netflix documentary FYRE: The Greatest Party That Never Happened! Release Date: January 18, 2019 on Netflix An exclusive behind the scenes look at the infamous unraveling of the Fyre music festival. According to Gizmodo.com, both Hulu and Netflix have released documentaries on the Fyre Festival fiasco. Both streaming companies have face controversy from their individual film. 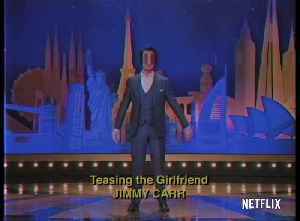 In fact, both of..
Jimmy Carr has gathered a selection of his very best jokes for the ultimate comedy special. A man who has devoted his life to crafting perfect gags and brutally brilliant one-liners, Jimmy’s new..